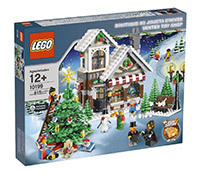 Several third-party retailers as well as Amazon.com are showing some of the season LEGO sets still in stock and still at or near the MSRP prices set out by LEGO on Amazon.com. Right now some of these sets are getting harder and harder to find, and I’m somewhat surprised they are still within $5-$10 of the MSRP. The Winter Toy Shops are incredibly hard to find, and I’m not sure if they will be manufactured after 2010. The Bakery sets will probably pop back up at the LEGO stores and online next fall. As for the Advent calendars, I’m not sure how that works – I believe they are limited to one year or two year runs as well. Obviously the prices are set to change as availability changes. If you are an Amazon Prime customer, you maybe able to have these shipped for free.